Helen the cat had severe glaucoma. Her eyes were bulging out of her skull, causing her severe pain and seriously affecting her balance. Bruce and Willis’ eyes were getting ulcerated, and also starting to protrude and get infected. 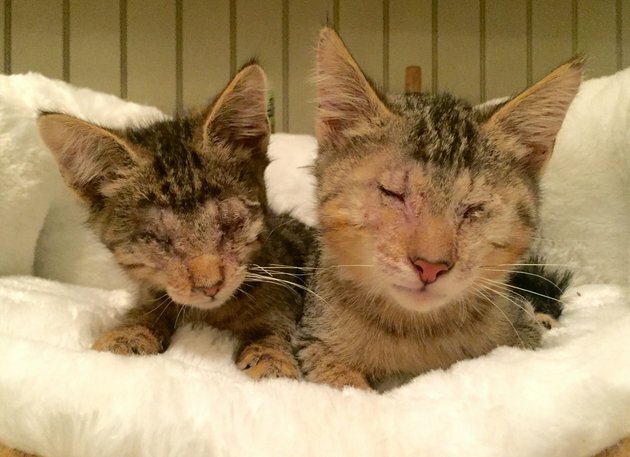 The rescue organization in Wilmington, DE had decided to remove the cats’ eyes to give them the best chance at living normal and pain-free lives. After their surgeries, however, none of the cats were adjusting well to a life in the dark. She set up a big playpen in the house she shares with two rescue pit bulls, Alfie and Frankie, and took all three kitties home. Alfie, who is gray with pointed ears, was discovered in 2012, locked in a shed and almost starved to death. Because of his physical condition he was scheduled to be euthanized until Stewart decided to take him in. “I picked up Alfie and I put him in the back seat of my car with my daughter. He looked up at her, gave her a kiss and we knew he was ours,” Stewart said. Since then Alfie has been paying it forward by becoming a certified pet therapy dog. Frankie, also a rescue, “is a little over the top with his affection,” said Stewart. 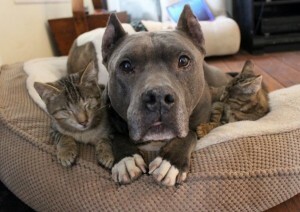 But the combination of both pit bulls’ nurturing personalities has helped the foster animals that come through Stewart’s house to heal — especially in the case of Helen, Bruce and Willis. 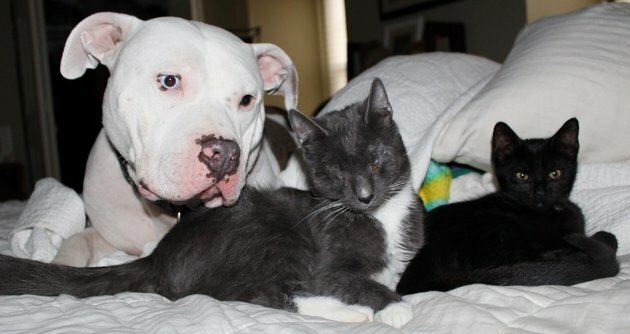 Ever since the three cats have arrived in Stewarts home, the trio is really thriving, thanks to her pups’ affection. In fact, Bruce, the smaller of the two kittens, feels so comfortable around Stewart’s two dogs that he naps on Alfie’s back.